Arrive Mumbai. You will be met by our representative and transfer to hotel for overnight stay. After breakfast, morning cruise across the harbour (9 kms) to see Elephanta Caves noted for its huge rock cuts. Afternoon tour of Mumbai city. Main attractions are Kamla Nehru Park, Hanging Gardens situated on the slopes of Malabar Hill offering a panoramic view of Marine drive, Mani Bhawan, Gateway of India & drive through the Crawford Market, Marine Drive & Flora Fountain. Overnight in Hotel. Mahaparinirvana Sculpture at Ajanta Morning excursion to Ajanta Caves, Ajanta is situated at a distance of 99 Kms and 03 hrs drive from the Aurangabad city. Ajanta is famous for paintings and sculptures, considered as master pieces of Buddhist religious art. Back to Aurangabad, overnight stay at the hotel. (Ajanta Caves remains closed on Mondays). 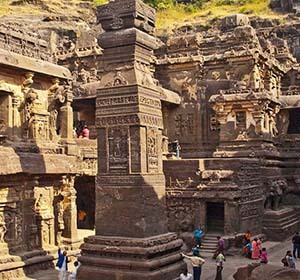 After breakfast, excursion to Ellora Caves situated 30 Kms from Aurangabad, Ellora houses the several uninterrupted monuments, dating back to 600 to 1000 A.D.The caves brings the ancient Indian civilization to life. Later transfer to the railway-station to board the train # 7618 Tapovan Exp dep at 14:40 hrs and arr at 22:05 hrs. Upon arrival transfer to the International Airport to board the flight for onward destination. (Ellora Caves are closed on Tuesdays).